But yet do not, in point of fact. 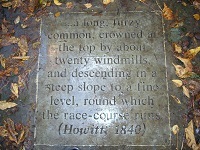 Welcome to the Nottingham Arboretum which, as one commentator remarked when it opened in 1852, is bigger than Derby’s! Not a point to overlook for many of us living in Nottingham at the right end of the A52. In fact, the opening of the Arboretum on Tuesday 11 May 1852 was a big occasion too. Accurate estimates for the numbers who attended are difficult to pin down, but we can be fairly sure from contemporary accounts that some 10,000 people arrived by public transport, much of which was especially laid on for the purpose. A procession led by the Inclosure Committee of the Town Council left the Exchange Hall in Clumber Street, entered the Arboretum through the eastern gate via the tunnel and circumnavigated the park. Here the Mayor, W. Felkin, gave a speech celebrating the Inclosure Act which had provided additional land vital to Nottingham’s development. 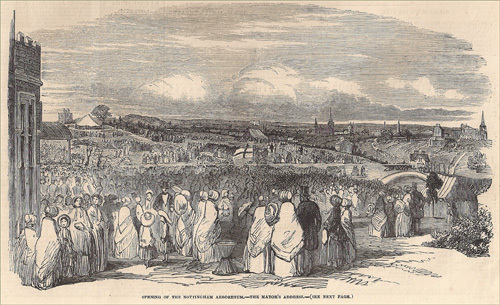 Illustrations of the crowds watching the mayoral procession around the Arboretum show a sea of people thronged along the avenues. Reports of the opening appeared in many provincial papers and a detailed contemporary account which survives tells us much of what took place. 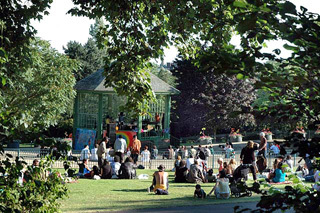 For several years after the opening, the occasion would be celebrated each year with a public holiday in Nottingham, which brought thousands more to the Arboretum to take part in or observe a whole range of entertainments. Unfortunately, the practice of granting annual holidays was discontinued, victim of the arguments about the extent to which visitors could be charged for entry. Why was the Nottingham Arboretum considered so important and, indeed, should be considered so today? One reason clearly is that it represents a strand of the enormous enthusiasm for scientific enquiry so resonant of the period. This is not just a park; this is an attractive place of learning about some key aspects of botany, as it holds examples of species found together in few other places. 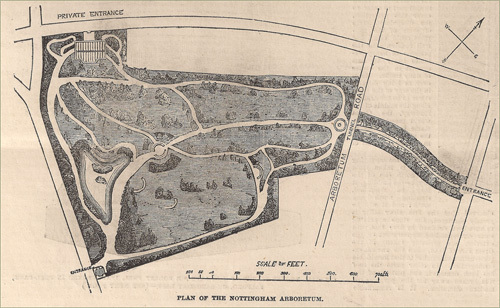 Secondly, the Arboretum, founded as it was through the Nottingham Inclosure Act of 1845, is a celebration of the development of a city which extended its boundary out beyond the Forest and so created the land for its development. Designed by Samuel Curtis, the Arboretum is an initiative of the people of Nottingham and its representatives, and is a celebration of local civic values providing both education and exercise. Do you or your group have any stories, pictures, memories or other information related to Nottingham Arboretum?